A black and white photograph of Marjorie Georgina Ruddy, 1908-1980. Marjorie Georgina Ruddy was born at Millbrook, Ontario, on February 2, 1908, a daughter of lawyer Robert Ruddy. The family moved to Whitby in 1917 when Robert Ruddy was appointed junior Judge for the County of Ontario. 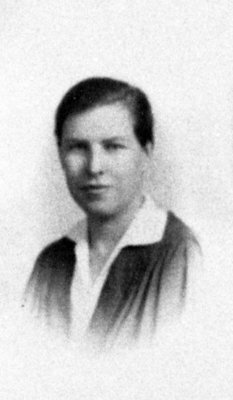 Miss Ruddy attended Ontario Ladies' College and Whitby High School. In 1929 she organized the first Girl Guide Company in Whitby. In 1933 she began writing a column on birds for The Globe (Toronto) and in the 1930s she was a Whitby area reporter for The Globe and the Globe and Mail. In 1930 she began taking photographs in Whitby and was a commercial and police and press photographer until she retired in 1960. Miss Ruddy was the first photographer in the Canadian Women's Army Corps in 1942 and served until 1945. She operated a photo studio in Whitby from 1945 to 1960. Marjorie Ruddy later worked at the Whitby Psychiatric Hospital, and died at Whitby on September 15, 1980. She is buried at St. John's Anglican Cemetery, Port Whitby. Marjorie Georgina Ruddy, Date Unknown, Photographer Unknown. Whitby Archives A2013_040_088A.